In 2004, the Detroit Pistons beat the Los Angeles Lakers and won the national championship. There was a lot of talk at the time about how the Pistons were a “team” and the Lakers were “Kobe and some other guys”. That theory is why some believe they won the championship that year. We’ve heard it a million times. Team work makes the dream work. You’re only as strong as your weakest link. There’s no “I” in team. Over the last couple of weeks, I’ve heard over and over again that people rooting for the Denver Broncos today because of Peyton Manning. Yes, he’s an excellent player and has been for many years. But he’s also a nice guy. Like a really nice guy. Truly nice. Luckily, there’s room on the bandwagon for those of us who want to see the nice guy win. 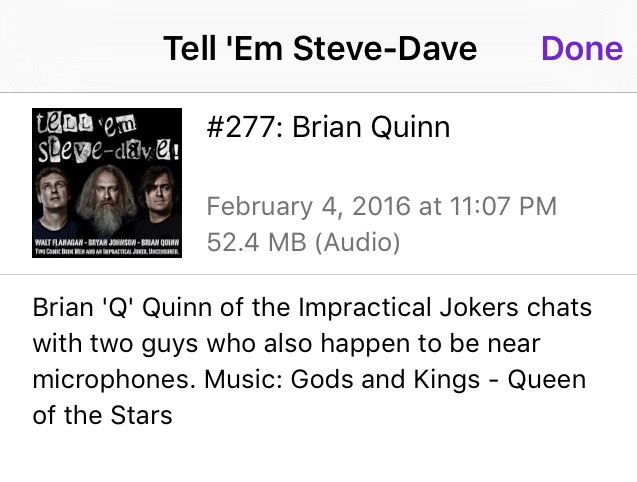 One of my favorite podcasts, Tell ‘Em Steve Dave, announced on a recent episode that when Brian Quinn, one of the hosts of the show, was featured in the title or description, it got better ratings and downloads than titles without it. Better known as Q, Quinn is also one of the stars of TruTv’s Impractical Jokers. Fans of Q are finding Tell ‘Em Steve Dave because of him, and their listenership is growing. Fun fact: this week’s episode was simply named “Brian Quinn”. Think of all your favorite things. How did you find out about them? Maybe a friend found out you were a bookworm and turned you onto a cool new book club. Or you saw one guy perform in a club and later, you found out he’s part of a band and you start listening to them. Or you started doing yoga because your roommate insisted and now you are part of a whole new community. One person turned you on to something and you are part of a team. Sometimes, there is an “I” in team. It just may not be the “I” you expect.